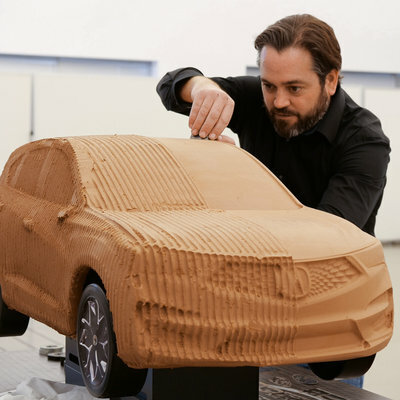 The exterior design of a car plays a major role in its identity; few of us will purchase a car if we don't connect with its outward appearance. Yet the bulk of our experience with any car comes from within its interior. 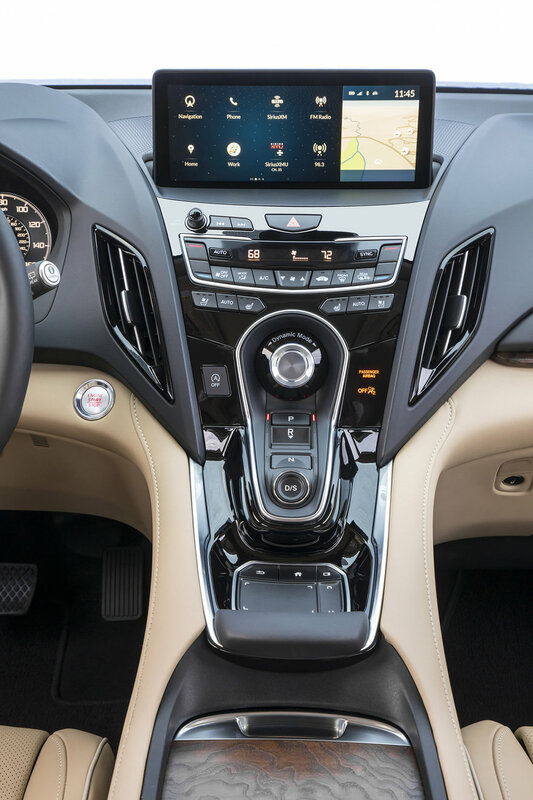 The materials, shapes, controls, gauges and screens we interface with, whether at high speed or whilst stuck in stop-and-go traffic, will occupy a far greater quantity of our attention than time spent staring at the car's exterior will. Designing and executing that interior is a very difficult job, not least of which is because the exterior it fits within has already, to a large part, been determined. The interior designer must execute his or her vision within both design and engineering constraints by using a combination of artistry and science. 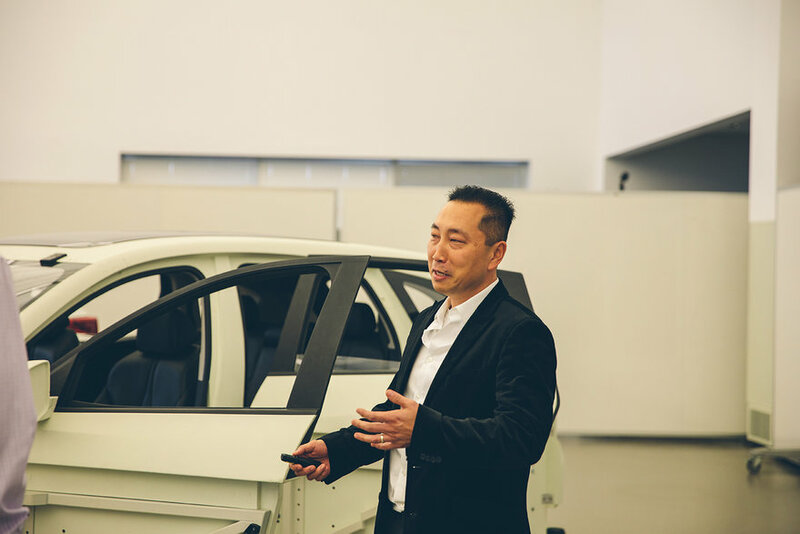 To walk you through this process, we chatted with design veteran Simon Yu at the Acura Design Studio. Simon Yu: I'm a Senior Interior Designer at the Acura Design Studio. I've been with this company for about 17 years. 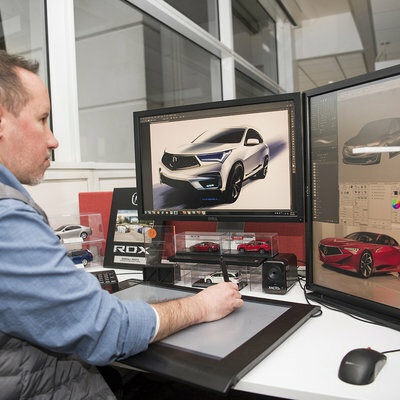 I've worked on numerous projects, including the last two generations of MDX's as well as the NSX. 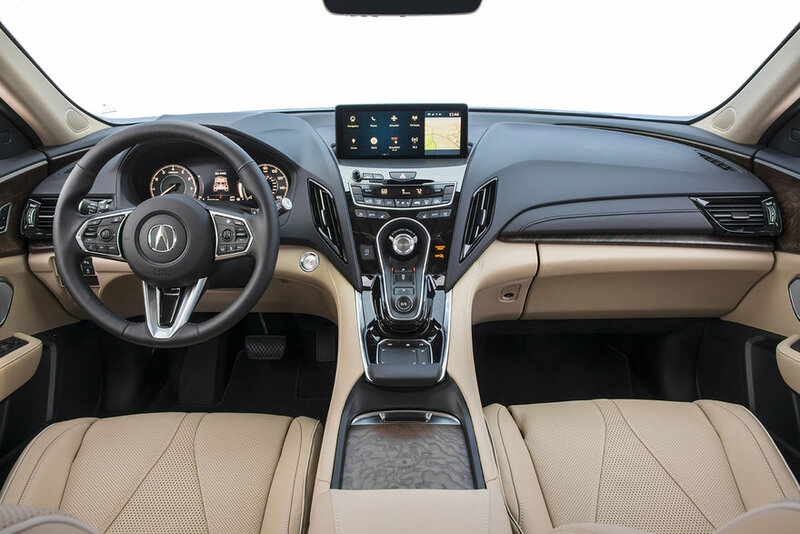 I was the project leader for the Acura RDX. As a kid I always liked to draw robots and spaceships. I was a kid in the '80s and '90s, so the biggest influence I had was RoboTech. When I came home from school that was always the first thing I watched, I loved it. I had a lot of manga influence, Akira, Ghost in the Shell, I love the drawings and intricate details of Masamune Shiro. These things were huge influences both as a person and a designer. I'm originally from South Korea, my parents immigrated here when I was 10 years old. When I was 11, my cousin here in California bought a red Chevy Camaro Z/28, which was amazing at that time. It was red and silver and it made quite an impression on me. From that point on, I was drawing cars all the time. California upbringing, liked to draw, car lover, let me guess: You went to ArtCenter? Well before I went to ArtCenter, I actually went to actually UCLA for a couple of years, because my parents are Asian; they didn't believe in art as a career. But eventually I was able to convince them that it's a good career. After getting into ArtCenter, I was able to get an internship with one of the Big Three in Detroit. It was a great experience and I learned quite a bit, but I was there in Detroit from December to April, and coming from California it was very shocking--I didn't see the sun for four months. Spending time there made me realize that living in L.A. gives you a lot of different opportunities, resources and influences that you don't get from anywhere else. Not just sunshine but also different cultures, backgrounds and cars. When I was in Detroit, all I'd see were cars from the Big Three. And here in L.A., I see all kinds of different cars. I realized that diversity is fuel for creativity, and L.A. provides that visual influence. By chatting with the stylist, the clay modeler and the digital modeler we learned about the workflow for the exterior designers. What is the process for the interior design? As Dave [Marek, Acura Executive Creative Director] mentioned earlier, any project here always starts with a concept. That's the most important part of the project because it combines everybody's [mission] from the executives to the engineers to the designers. Once you have that set, you can begin. 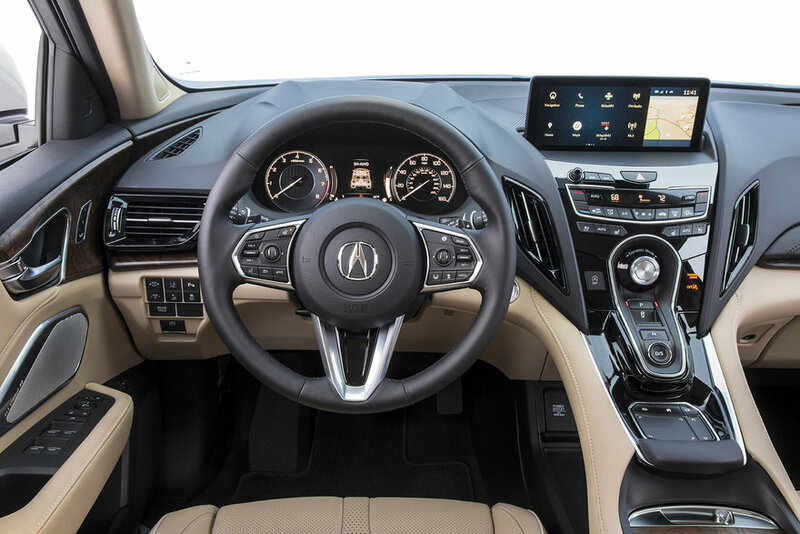 For the RDX interior, we came up with a concept called the Penthouse Control Center. We wanted to capture the premium aspect of a modern, open-space penthouse. Kind of a futuristic penthouse in the clouds with a commanding view, being able to see everything outside. 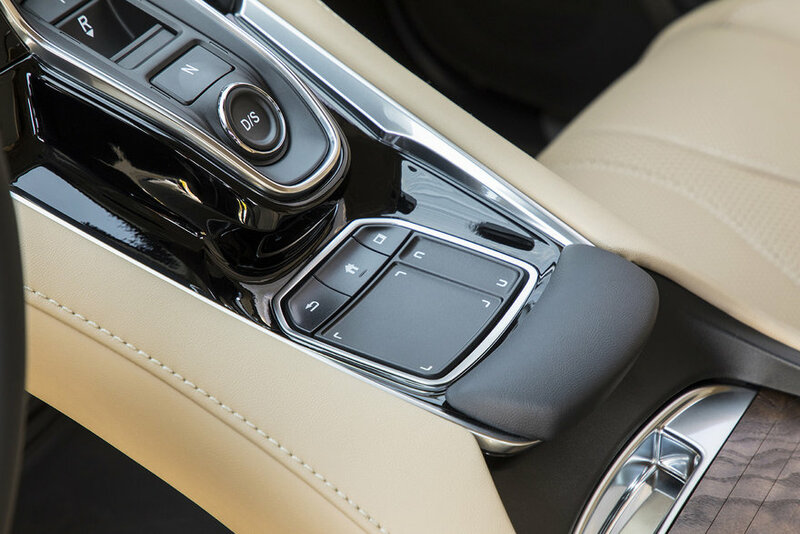 [One element of this] would be focused on the personal, with the control center being the new HMI system, where we're introducing the all new True Touchpad interface. Another aspect was that we wanted to make innovative use of materials--real materials, not just stickers. We really wanted the material to be an intricate, integrated part of the design itself, built with exceptional quality and craftsmanship. So those were the concepts. With those established, we started sketching the overall look of the interior. We developed an overall dual personal structure concept for the interior, with a symmetrical space for both driver and passenger. To integrate the Penthouse Control Center concept we applied this bold and wide "penthouse" space underneath the instrument panel. It's long, elongated, to create this open, light feeling. 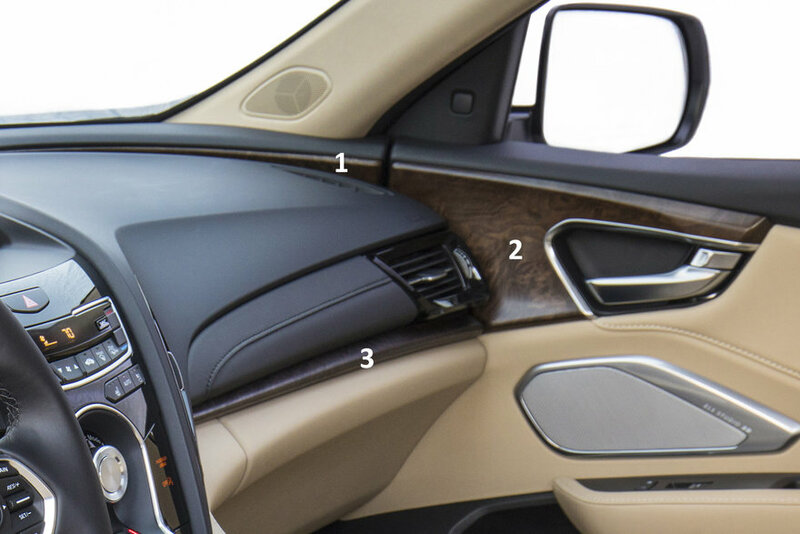 The wood trim structure is an intricate part of the interior, not just decoration. The elevated control structure celebrates the new HMI system with the True Touchpad interface. So those are the key elements for the actual structure. 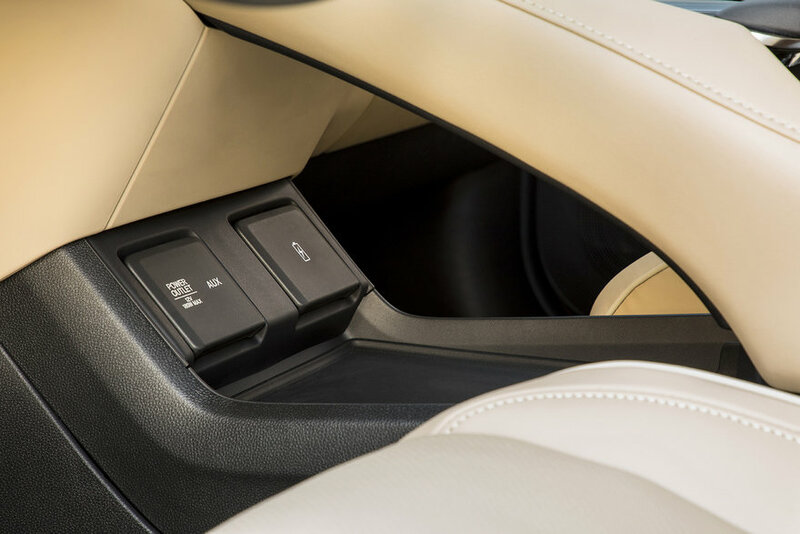 The center console not only features the True Touchpad interface, but shows the further functionality of the console with the cup holder goes, a place for a phone, and the creation of a new space underneath the shift bar wire for the customers to use. One of my favorite things about the IP (instrument panel] is the wood trim structure that goes underneath. We're only using three small pieces [see numbers on images below] for the panel, but by creating that one space, your eyes [fill in the blanks to] create this whole gigantic space underneath it, giving this IP a light, woody, layered, floating appearance. We maintained the floating console from the PCC concept. It creates a very light, airy feel for the interior, and we can achieve that because we're using shift-by-wire. It's not a regular shifter, it's now floating on the floor. So by creating new technology, we're creating new space for the customers to use. We really wanted to celebrate the True Touch interface and make sure it's going to be easy for the customer to use. So it's on the high center point of the console. Both the driver and passenger can use it. The seat is new, and the concept for it was a tuxedo. 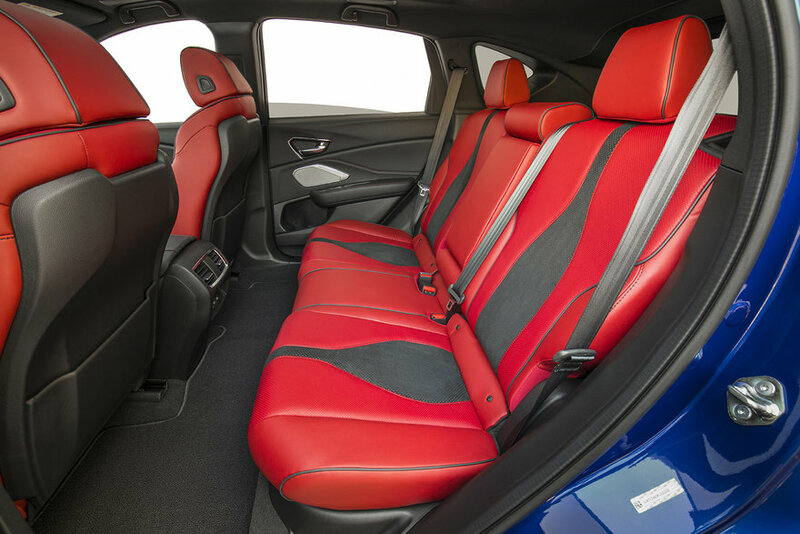 We really wanted to make the seat more formal and premium from the previous generations, and of course it has to be comfortable as well, and the rear seats must match. 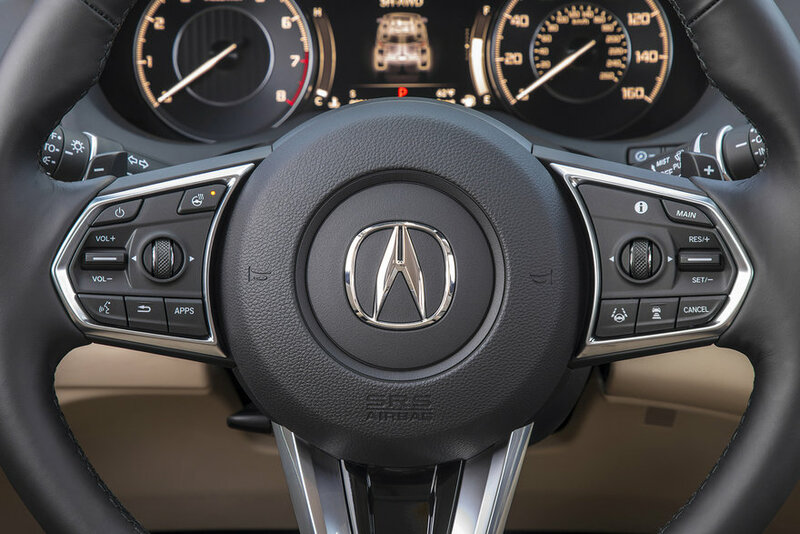 This is the only steering wheel we've done yet that incorporates the all-new HMI system, so the customers never have to reach out from the steering wheel if they don't want to. They can control the whole HMI system from the wheel. Lastly, the material usage of this interior is very crucial. If it looks like wood, it's real wood. If it looks like metal, it's real metal. And the craftsmanship on the stitching, the personal touch, is very crucial for the premium market. How do you go from these airy concepts into hard production? So in our process, those [desired elements I just described] are what we present to our executive for approval. Once they approve our direction, then we go into more of a feasibility level. So it goes from more of an artistic representation of the interior to more of an industrial design aspect of the interior. We have to create a very accurate drawing with a grid system so that engineers understand what the shapes look like, and where we can fit all of the stuff that we need to fit. 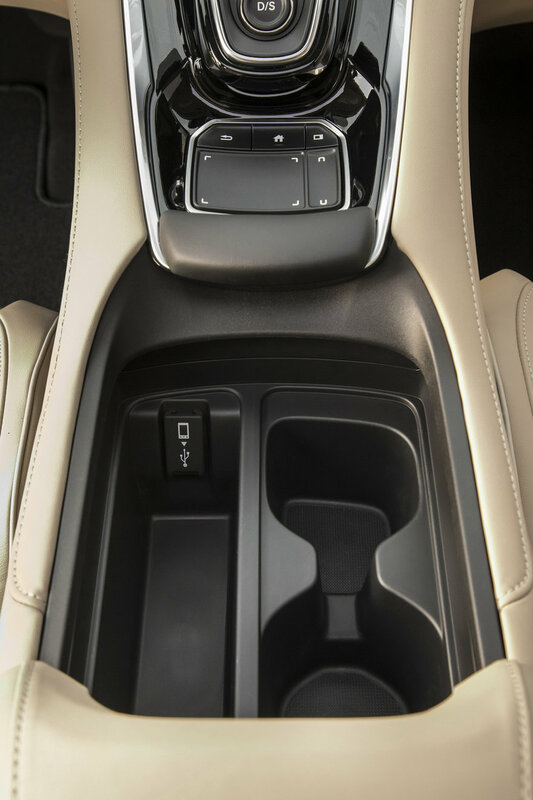 Where the cup holders go, where the shift-by-wire system goes. The plan view is very important, that's where you work out if you have enough space to put a cup holder and still have accessibility to the touchpad. Then we do [an elevation] drawing showing the door interior from inside--something that you'd never see in real life, but we need to do it for our modelers and engineers to understand, to make sure the layout fits with the speakers, inner handles, storage spaces. These drawings have to be very accurate. How granular do you guys get with the design, versus having access to off-the-internal-shelf parts? This is a production studio, so we design everything from the needles to the meter graphics. 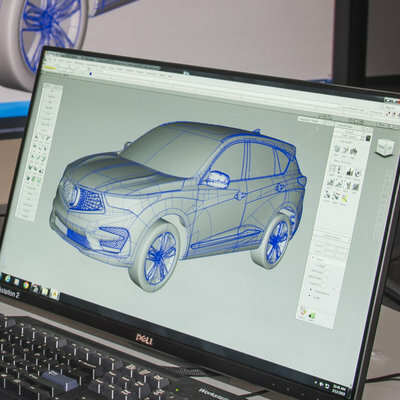 Every single detail has to be designed and validated, and we work with engineers to ensure feasibility. So with all of these detail drawings done, we're now able to create a 3D mock-up out of foam. It's hard, but it's covered in the materials that we wanted to apply in the production car. So, while parts of it don't actually function, the executive can sit inside the mock-up and make sure everything is reachable, there's enough knee room, you can touch this and grab that. So you can validate all of the design functions, not just the style. Once you get approval, then you work with the engineers in Ohio to make it real. Essentially that's where the fun begins, as we work towards maturation. And [with this project] we didn't really lose [much] to be honest. If anything, the design maturation really helped. The wraparound, floating IP, the console, the True-Touchpad interface, the sleek design, all of these things had been kept from the initial concept sketch to the production, which is a very rare thing. It's a pretty difficult process, because when you're sketching a lot of the stuff, you don't know if it's possible or not. But we try to push as much as possible. 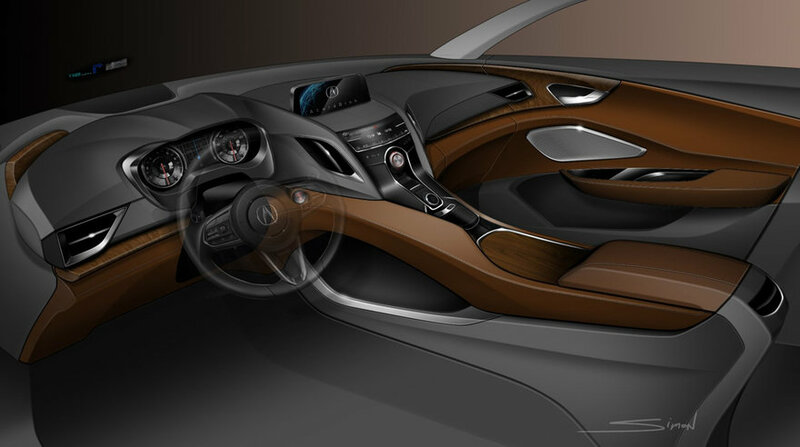 And having the Precision Concept interior as a North Star, we tried to achieve that image in the production. And that's what we did in RDX. You mentioned it's rare to have so many design elements survive the maturation phase. Was there something different about the process with this project? I think we worked really well with engineers and we had really strong concepts, with both the Precision and the PCC that everybody loved. That helped keep the sense of styling intact. I think the concepts generated a lot of momentum, and everybody wanted to push to achieve that dream. It was definitely a challenge but I think the reward is overwhelming. Can you give us an example of anything that did change during the maturation phase? With the mock-up, we noticed that when you're driving, your hands start moving around, right? So you want some sort of anchor for your palms so that your hand doesn't move around when the car starts driving. So that was something we added at the maturation phase, and I think it worked out very well. The floating IP in particular looks difficult-to-engineer and presumably not cheap to produce. Were you afraid that would get axed? Absolutely correct on that. When I showed this sketch to our engineers, they were like "How do we make this?" They had no idea, they'd never done it before. So that was really challenging for them. From initial sketches to finished product, what was the most challenging thing to retain in the design? Obviously the floating console, and the authentic use of materials. Authentic materials are very expensive. It's much cheaper to do a plastic part that looks like metal. But we really wanted to keep that authenticity for this premium market. So that was one of the big challenges, [the bean counters] always want to cut costs. But we were able to keep both of those, and I think that [the success] speaks for itself in the sales numbers. People love this car. Was there anything in the initial design that you had to give up, and were sad to see go? There were many things. As a designer, you want to keep everything. But you have to be realistic and realize that we have to sell and make money on these cars. So in the face of compromise, you have to prioritize what is important to you as far as design goes. We kept all of the good stuff that we could. 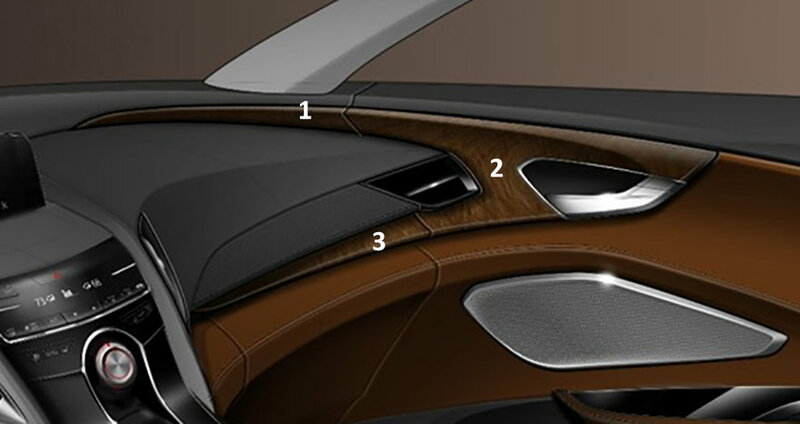 Up Next: As Yu mentioned, the materials choices for the RDX interior were a crucial element. In the final installment of the series, we'll look at the CMF (Color, Material, Finish) designers responsible for creating the interior surfaces.